1.4 What Do Cutworms Eat? 3.1 Q: What are the largest and smallest cutworms in the garden? 3.2 Q: Cutworms in my compost pile – is that bad? Have you ever stepped out into the garden, only to discover that it looks like someone snipped through the main stem of one of your plants with a pair of scissors? If so, you have fallen victim to the hungry jaws of a cutworm. These caterpillars are a major common agricultural pest, and if they aren’t stopped, your young plants will never survive to maturity. Today, we’re going to delve into the intricate world of the cutworm moth, part of the Noctuidae family of moths, and discover everything there is to know about different species. More importantly, I’ll tell you how to eradicate these seedling-slayers and to protect your garden from future infestation. The term ‘cutworm’ refers to the habit that these worms have of chewing right through the stem of a plant. Many species of cutworms are part of the Noctuidae family. However, not all noctuids are cutworms, and in fact, there are a couple other moth species which have similar behaviors. For simplicity’s sake, I’m going to stick with the noctuids for this piece, as they’re by and large the worst of the cutworm species. 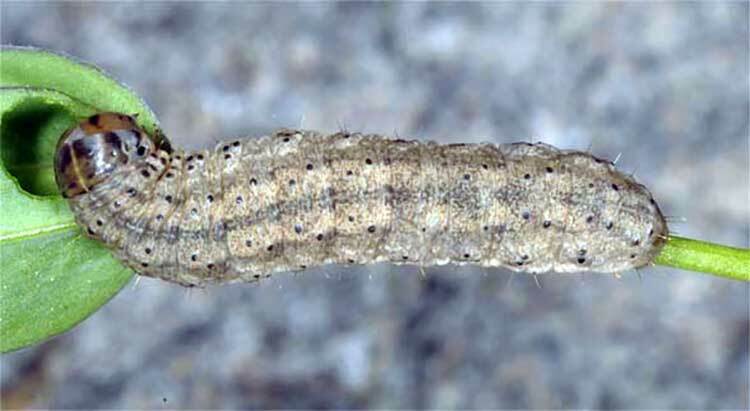 The army cutworm is a common pest throughout the western and prairie regions of the United States. It’s a common issue in agricultural regions, as its favored foodstuffs include wheat and oats. In late June or early July, the miller moth migrates to alpine regions to escape the summer sun, and then returns in the fall. 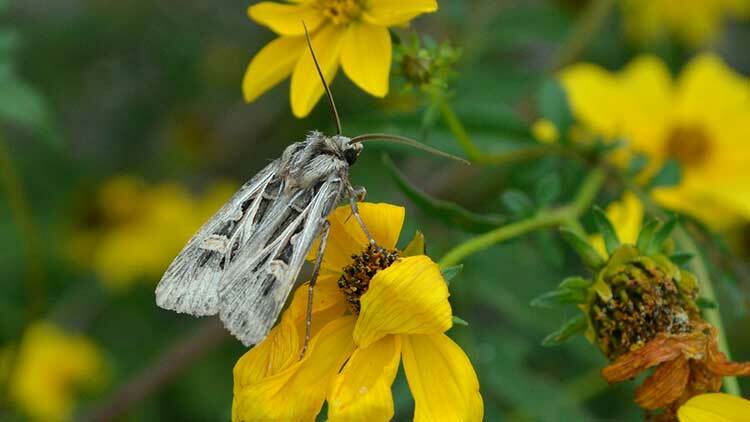 Interestingly, up to 72% of the moth’s body weight is fat, making it a rich food source for black or brown bears. The army cutworm has the highest known body fat percentage of any animal. 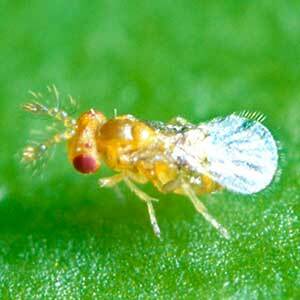 This species is a major agricultural pest throughout Asia, Europe, Africa, and Australia, and has spread to Brazil. As can be assumed by the term ‘cotton bollworm’, it is a major predator on cotton plants, but also will happily consume a variety of food crops or other plants. The tomato cutworm is widespread throughout the Americas, although it does not spread into the far north of Canada or into Alaska. It has slowly developed resistance to a number of agricultural insecticides, which makes it more complicated to control or eradicate. 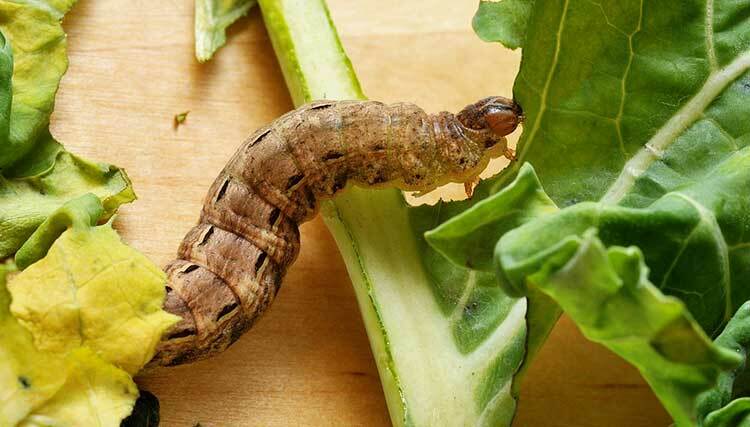 Another North American species, the dingy cutworm feeds on more than 40 varieties of plants, including field crops like alfalfa and wheat, assorted vegetables, and a selection of flowers. The black cutworm can be found worldwide, although it’s less common in some tropical regions or colder areas. It’s more widespread in the northern hemisphere than in the southern, but appears in both. In the midwestern US, the black cutworm is a severe problem for corn farmers, although it’s also problematic in other food crops. This species is very common in Europe, but has also spread to Africa and Asia. It’s not presently believed to be in the United States. The turnip moth is considered to be particularly dangerous to cereal crops and root vegetables. The heart and dart is incredibly common in the Palearctic ecosystem, spanning from Ireland all the way to Japan. It consumes everything from lettuces through root crops, cereals and vegetable plants. Common to Australia, India, Sri Lanka, Indonesia, and most of Africa, the catapult moth is a fruit-loving species. It happily cuts through young saplings of peach and citrus trees and a variety of other plants from that area of the world. Abundant throughout the Palearctic ecozone, Europe, the Middle East, and unfortunately introduced to North America in the 1980’s, the winter cutworm moth is one of the largest moths that I’m covering today. Widely known as an agricultural nightmare, this insect preys on a wide variety of root and vining crops, including tomatoes, grapes, potatoes, and carrots, among others. 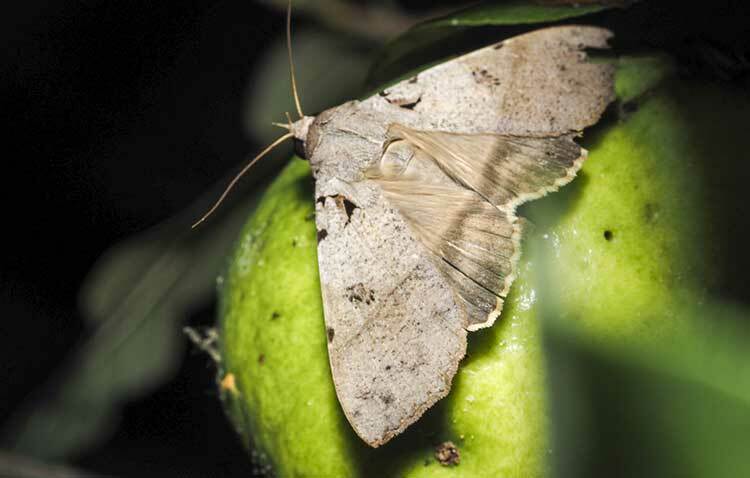 They tend to be difficult to eliminate once a large population of moths is visible in a given area. 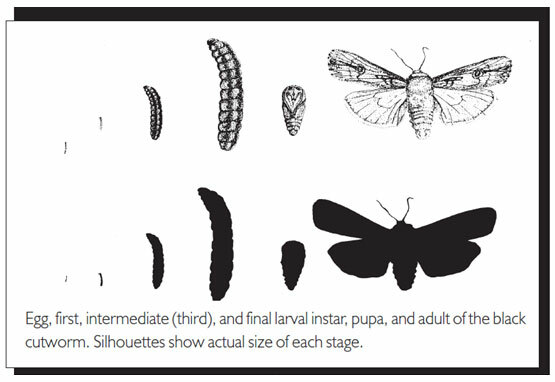 While there are some slight variations between the different species listed above, the general process for the lifecycle remains the same for all of these cutworms. The adult moth will lay her eggs, which she can produce hundreds of over the span of her lifetime. The location of the cutworm eggs varies by species, as sometimes they will be on the underside of leaves, sometimes on top, and occasionally on stems or stalks. Generally, these eggs will hatch in between three and five days. Once the young cutworm caterpillars have emerged, they go through larval stages called instars. Depending on the species, it will be between four and six different instars. The cutworm larvae are quite small when first hatched, but a cutworm larva will gradually get larger with each instar. The color of these larvae also varies by species, but most are grey, green, yellow, or brownish. 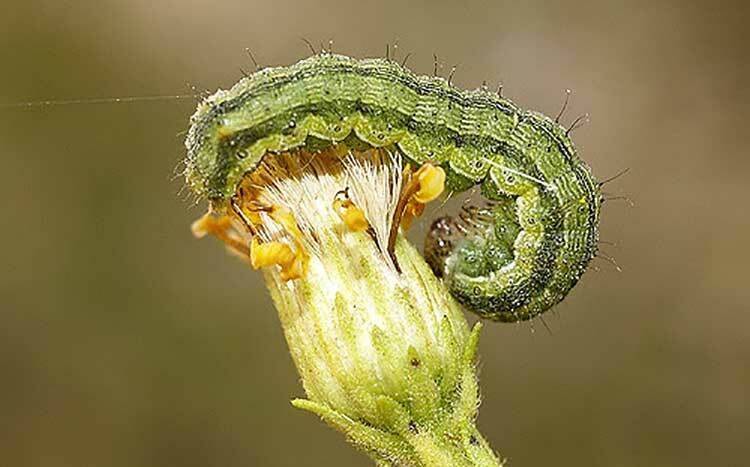 It is during this larval caterpillar state that cutworms are at their most devastating for plants, especially in the first couple instars when there is a huge population in a relatively small area around the host plant. 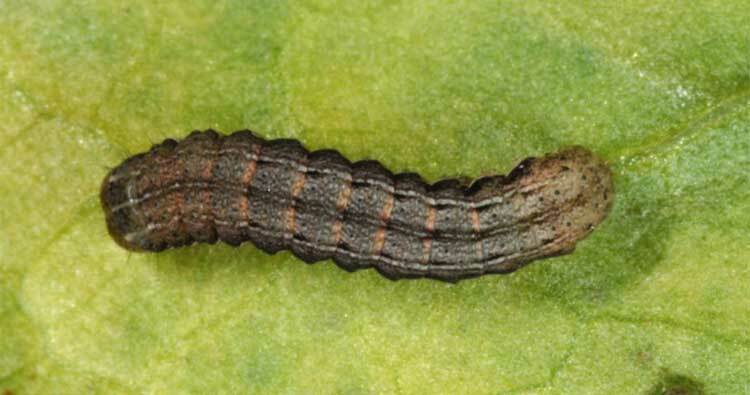 Some species of cutworm larvae are aggressive and have cannibalistic tendencies, so the larval population can sometimes reduce significantly by the third or fourth instar. When the instars are complete for the cutworm, it will build a cocoon and vanish within. Generally, within a couple of weeks to a month, the adult cutworm moth will emerge from that cocoon to begin life as an adult, and the cutworm life cycle will begin anew. 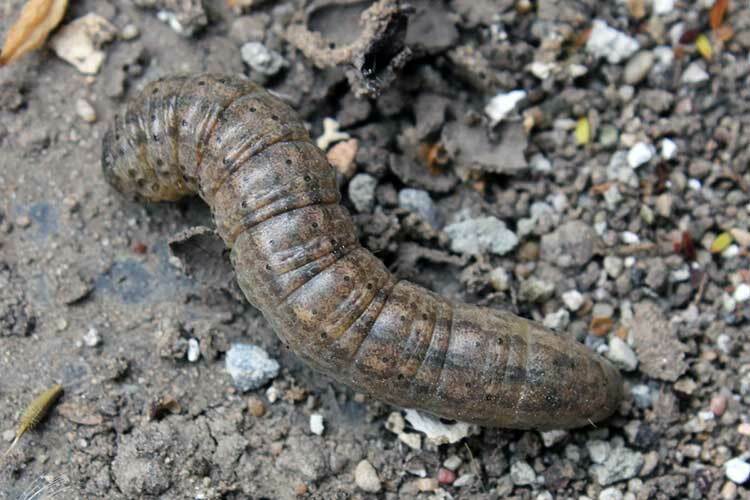 Cutworm caterpillars and moths are able to overwinter in sheltered locations, occasionally putting themselves into a delayed developmental stage called diapause. Once they enter diapause, which is a form of dormancy, they can only emerge from diapause when conditions are favorable. This ensures that they do not come out of dormancy midwinter, or during the hottest parts of the year. Habitats for cutworms vary extremely widely depending on the type of cutworm being referenced. Each species has a few favored plant types upon which they prefer to lay their eggs, generally their favorite types of food. However, the smaller species of cutworm moth can occasionally slip into houses and garages while flying, especially if they are seeking shelter from heat or cold. This is more a nuisance than a problem. Some cutworm larvae overwinter by digging into the soil. Those which do this tend to be damaging to root crops, as they will feed on the roots of plants just as readily as the greens. While different species have different preferences, most food crops are potentially at risk for cutworm infestation, as there are varieties of cutworm that eat virtually all of them. In addition, a variety of nonedibles are at risk, including things like cotton, tobacco, and flax. Most herbs seem to be at much less risk. Cutworms are also annoying to people who want to have the perfect lawn. They cut off blades of turf grass just above the soil’s surface, and leave pockets of dead or sliced grass that can ruin the visual appearance. While they can’t destroy an entire lawn (unless there are an awful lot of them), it certainly wouldn’t look good in the yard! There are a couple of basic things which any gardener can do to eliminate cutworms. Obviously, handpicking them out of the garden at night is one choice, since that’s when they’ll be most active. Tilling the soil where cutworm larvae may have overwintered can expose them and allow for birds to eat them, as well. But what do you do if picking or feeding the birds just isn’t enough? Let’s explore some methods of wiping them out. 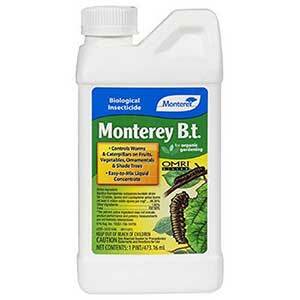 A common option for any sort of caterpillar prevention is to use Bacillus thuringiensis, also known as BT. This soil-dwelling bacterium is often used as an organic insecticidal spray, and poisons cutworms quite effectively. The bacteria can also assist in the destruction of cutworm eggs. Popular because of its wide and varied uses, food-grade diatomaceous earth is often used against cutworms as well as a myriad of other insect pests. Its crystalline structure is harmless to humans and pets, but causes cuts in the soft skin of cutworm caterpillars, causing them to slowly dehydrate and die. A product like Eco-Bran can also be quite effective. Eco-Bran is a granular material that you spread around your plants. It contains a very low percentage (2%) of carbaryl, which is an insecticide. This acts as a bait, and draws insects with chewing mouthparts (like cutworms, grasshoppers, and the like) to it and poisons the insects. It’s harmless to birds and most beneficial insects, but it is not available in all areas. While neem oil won’t generally kill cutworms, it does have a beneficial property: it coats the eggs and makes them less likely to hatch. If you’re waiting impatiently for another product to arrive and have neem oil around, it can at least slow impending outbreaks of cutworms a little bit. Since a cutworm larva will wrap itself around the stem of a plant and start chewing its way through, a popular means of environmental control is to block the cutworm from being able to encircle the stem. One way of doing this is to use toothpicks, nails, or pieces of drinking straw. Place these against the plant stem in a triangular pattern, and just placing them there blocks the cutworm from the stem. Another option is to use toilet paper or paper towel tubes, or ones cut from plastic bottles. Press about an inch of the tube under the soil, with the tube encircling a seedling. Be sure to get the seedling in the very center of the tube to allow for airflow around the stem. 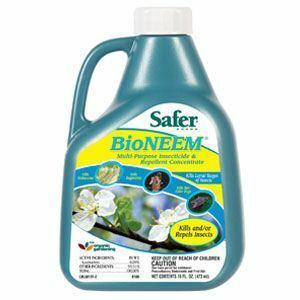 This offers protection from cutworms and other insects as well. The process is often referred to as collaring your plants. Beneficial nematodes can also be added to your garden. These tiny creatures will infest and consume both cutworm eggs and larvae, quickly stopping their spread. They also can build up in your soil and provide an extra layer of protection against other pests, such as root-knot nematodes (which they will eat). If you live in an area where toads are common, they will be quite happy to eat cutworms for you. Bot you and the toads will benefit from this arrangement. However, this might not be the best option if you have dogs or kids who might chase them back out of your garden. Birds also love to snack on these tasty treats! Finally, parasitic wasps and flies love to feast on caterpillars of all types. A parasitic wasp like the Trichogramma wasp will lay its eggs directly into a cutworm larva. When the eggs hatch inside the larva, the young wasp will eat its way out, killing the cutworm as it does so. The easiest way to repel cutworms is to prevent the moths from ever reaching the plants at all. To do that, use a floating row cover over your plants. A floating row cover will allow in sunlight and air, but will keep insects out provided that it’s secured well. 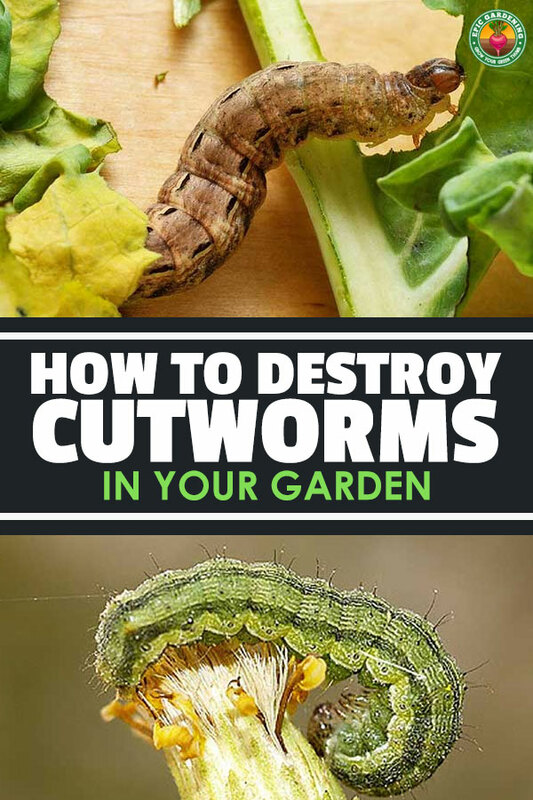 However, this may not repel cutworm larvae that have overwintered in your garden beds, and it also will keep pollinators out, so you have to remove it when you want bees to buzz around the plants. Using an abrasive mulch is a great way to discourage cutworms from overwintering in your soil. Mulches made out of shredded bark, rough and dry leaves, or eggshells will irritate their soft bodies, and they won’t want to dig through that material. While this doesn’t guarantee that they will always go elsewhere, it can be a way to make your garden less of an attractive target. Q: What are the largest and smallest cutworms in the garden? A: It’s difficult to pinpoint, as there’s a wide variety of species that are covered by the term “cut worm” (more even than I’m writing about today!). The initial larval stages can be incredibly small. A tenth or 2/10ths of an inch at hatching is not unusual for some species. As for how big they get, there are cutworm varieties that are easily two inches long in their last instar before developing their cocoon. It just really depends on the species. As a good general rule, the larger the moth, the larger that the cutworm caterpillar will become before it goes through its transition. Q: Cutworms in my compost pile – is that bad? A: While you may have found another grub or worm species, it’s unlikely to be a cutworm. 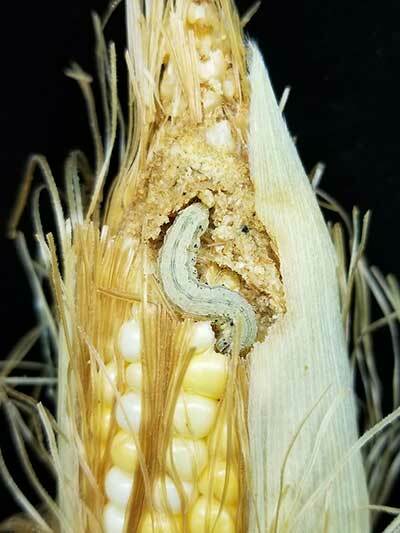 Cutworms feast upon live plants, not on dead ones. 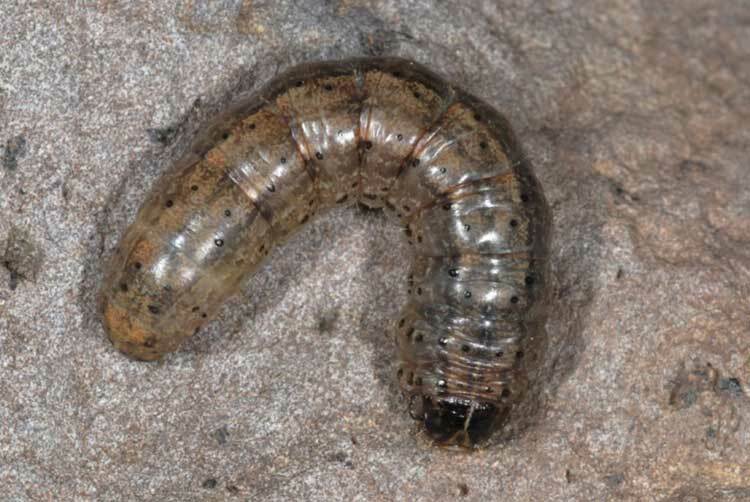 Often, people who think they’ve found a cutworm pupa or larva in their compost are actually seeing the grub stage of the black soldier fly, which is actually quite beneficial in a compost pile. Black soldier flies devour food scraps and rotting plant material and produce castings much like red wigglers or other vermicomposting worms do, and those are wonderful amendments for your soil. All things considered, while cutworms are a terror in the garden, all is not lost. You can prevent them with a little careful planning, and you can wipe them out with a bit of work. What measures have you taken to cut the cutworms out of your space? Share them in the comments! I have an invasion of cutworms in my turf grass (mentioned that I don’t have any plants, only grass), they are coming out during the night and are going to my patio, however can I use DIATOMACEOUS EARTH Feed Grade DE Powder SPECIAL GRADE DE Multi-Mite. As is a powder, can I spread it on turf surface before night is coming? Can I spread it on raining weather? 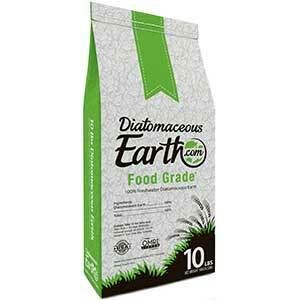 You can spread food-grade diatomaceous earth at any time of day. However, diatomaceous earth tends to soften up and clump in wet conditions and will need to be reapplied after the showers have ended. It’s only truly effective against cutworms when it’s dry. If you are watering your turf grass daily, it may not be the best choice for your needs. For turf applications, I highly recommend the use of beneficial nematodes. They will kill off cutworm larvae in the grass and other common turf pests like fleas as well, and they survive in both wet and dry conditions. Sorry about the delayed response, we’ve been a little behind recently! Unfortunately, from what you’ve said I can’t tell what type of insecticide you’ve used, so I can’t give any recommendations on how long to wait before mulching. Delays will vary depending on the insecticide used, and can be anywhere from a day or two to weeks. I’m suspecting that if you had 7 yards of mulch in the driveway, you’ve spread it by now, but I hope your cutworm problem has subsided!